Luke Cole scored a hat-trick as Whitnash Town beat Folly Lane 4-0. Whitnash Town’s Coventry Alliance Premier Division title hopes remain in their own hands after they thrashed league leaders Folly Lane 4-0 on Tuesday evening. Trailing Folly Lane by ten points, Town knew they had to win the game to have any chance of the championship despite holding two games in hand on their rivals. And the three points mean wins in their final four fixtures, which include a potential title decider at Lane on May 19, will guarantee the league for Whitnash. A resolute first-half performance into the wind set up Town’s win, with manager Barry Shearsby saying the opening goal proved all-important. “Folly Lane didn’t need to win, but we knew we had to,” said Shearsby. Whitnash went toe to toe with their visitors and, despite Folly Lane hitting the post, clear-cut chances were scarce. 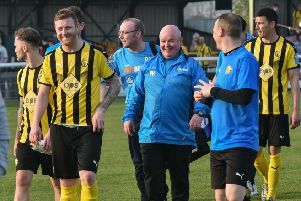 Luke Cole broke the deadlock, slotting home after a Craig Watkin cross had been flicked on and Cole doubled his, and Town’s tally, five minutes into the second half, pouncing on a goalkeeping fumble. Cole went on to complete his hat-trick and Henry Leaver added gloss with a fourth to cap a slick second-half performance from the title challengers. On Saturday, Town showed off their passing ability to good effect on Woodlands’ 4G pitch, running out 8-0 winners. Whitnash opened the scoring inside the opening minute when a great through ball from Watkin was superbly converted by Cole. Jack Taylor made it 2-0 and, despite Cole receiving a harsh red card for a challenge on the Woodlands winger, the visitors remained in control . Kevin McGarvey made it 3-0 from a free-kick which saw Woodlands reduced to ten and Town went on to add five more through Craig Watkin (penalty), Emmett McGuckin, Lewis Scott, Paul Wilkinson and John Blunsom.